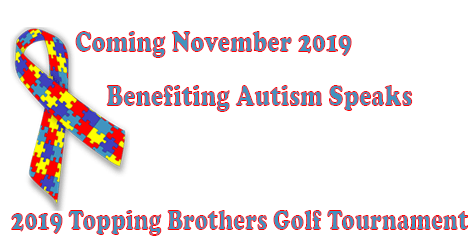 As we are totally committed to Autism Speaks, with our own Topping Brothers, 9TH Annual Golf Tournament coming this November 2019 at The Oaks Club Valencia. Raising Awareness on Autism and finding a cure is Paramount. Visit AutismSpeaksSCV.com to donate now! We’d like to take a moment to recognize all of the Autism Warriors out there working to make a difference! Visit Here to see those who really care! Every year in November we Play Golf, have Fun, and help raise money for Autism Speaks. If you’re unable to join us to play golf at The Oaks Club Valencia this coming November, you can help in other ways. Support this worthwhile cause!